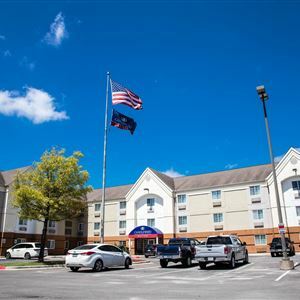 With a stay at Candlewood Suites Austin-South in Austin (Franklin Park), you'll be close to St. Edward's University and McKinney Falls State Park. This hotel is within close proximity of Garrison Park and Lady Bird Lake. Make yourself at home in one of the 122 air-conditioned rooms featuring kitchens with full-sized refrigerators/freezers and microwaves. Wired and wireless Internet access is complimentary, and flat-screen televisions with cable programming provide entertainment. Conveniences include safes and desks, and housekeeping is provided weekly. Take advantage of recreation opportunities such as a 24-hour fitness center, or other amenities including complimentary wireless Internet access and gift shops/newsstands. Additional features at this hotel include a picnic area and barbecue grills.